While traditional outdoor seating satisfies the need for a public resting place, it neglects the need for recreational facilities for entertainment. The Funny Chair combines seating with a seesaw. 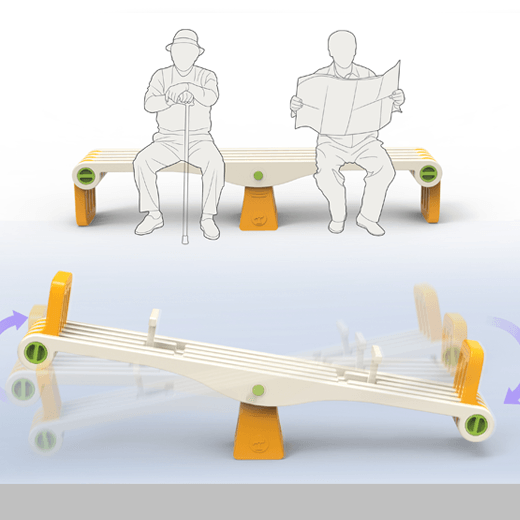 By turning the fulcrum on both sides, the seat turns into a seesaw for children to play on. The Funny Chair can meet the needs of different groups of people. It not only expands the use of public facilities, but also more efficiently uses the space. Designed by: Yunwen Sun, Jin He, Haonan Xi, Jizhe Wang and Haimo Bao of School of Design, Dalian Minzu University and the 38th Research Institute of China Electronics Technology Group Corp.